Growing up in New York City, my first dining out experience was going to Chinatown with my family. My mom always said it was the only place she knew where we would not embarrass her. In those days, we always started dinner with egg rolls and moved on to one brother wanting snails with black bean sauce, the other brother wanting chicken egg foo young and nothing else and my insisting I must have lobster Cantonese. In the dark days of my Boreum Hill, Brooklyn neighborhood, good restaurants or really any restaurants were practically nonexistent. Yes, what is now Smith street’s “restaurant row” was a ghost town, unless you count the odd Latino greasy spoon or the bulletproof glass Chinese take-out joints. Chinese take-out joints were plentiful and identical. Basically, it was hole-in-wall with disposable furniture of a table or two and some folding chairs. The paper menu was slapped on the wall next to the ordering fortress. Where you put in your order there was bulletproof glass strategically placed in layers with just enough room to pass a bag of food through. The concept was you couldn’t point a gun straight in and rob the place. The staff was securely locked behind a metal gate. You’d order and pass your money between the bullet proof glass layers and they’d pass back your change. When your food was done, they’d slide it back between the glass. There are a few remnants of these places on Smith Street, but the glass barrier has long disappeared since the neighborhood got fancy. The standard order in my hood was fried chicken with fried rice or French fries. The Chinese definitely played by the give-the-people-what-they-want rule. They sold pork egg rolls two for a dollar. They were predominately cabbage with flecks of carrots and an inkling of actual pork sprinkled in. But they were hot, crunchy and delicious with the duck sauce packet squeezed on them. These days, we know it was just rusty colored corn syrup, but then, it totally worked. I have not “dined” at a Chinese take-out joint or even gotten take-out in many years because they are kinda gross (they lost me when they started using pre-fabricated chicken morsels), so I don’t even know if you can get an egg roll there, but I imagine you could. Egg rolls are really hard to find in most authentic Chinese restaurants because they are a Chinese-American creation from the 1930’s. Spring rolls, are made with the thinner wheat pastry and have their roots in Asia, so they are easier to find. Egg rolls just have their roots in my memories. The bite the corners of my mind. 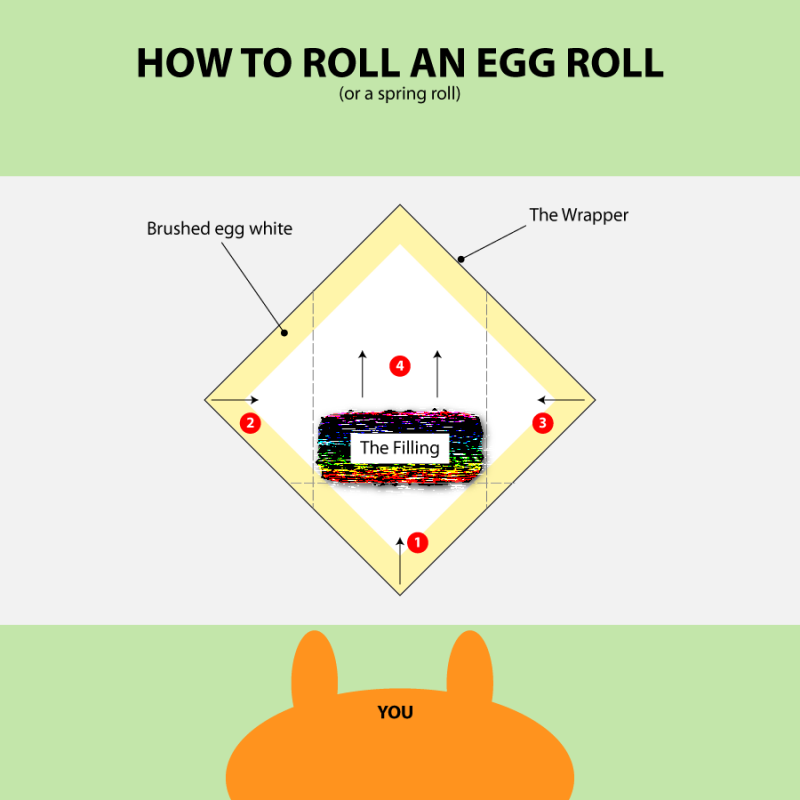 I want that puckered pastry you only find on a egg roll. That is not easy to find either. 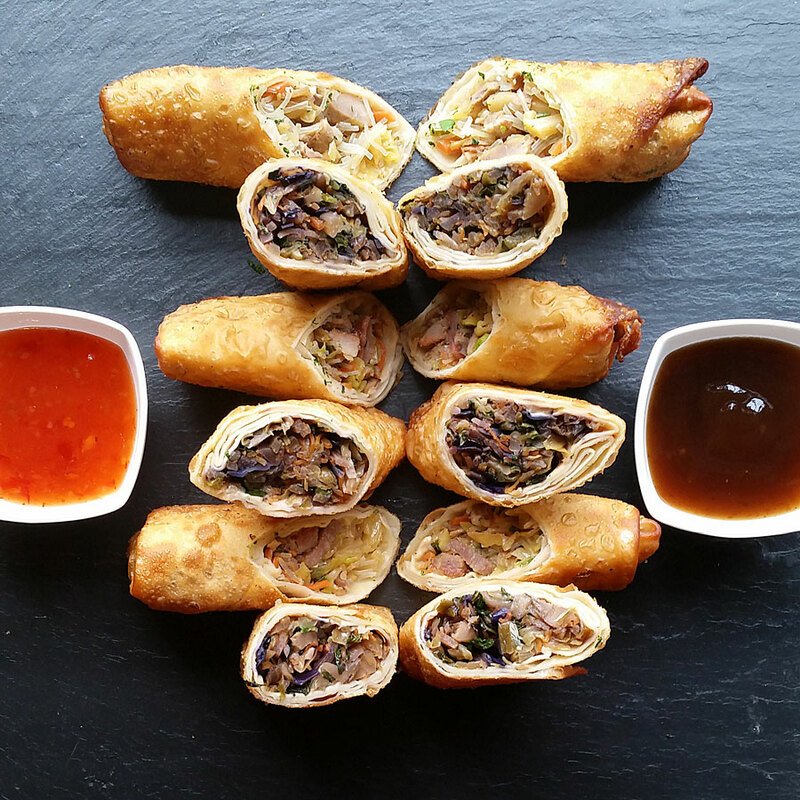 If you can’t find egg roll pastry, you can use spring roll pastry. I decided to make egg rolls for Thanksgiving appetizers and again for Chinese New Year appetizers. I made traditional Roast Pork and 10 Veggie Egg Rolls. A lot of my guests grew up in New York City too, so they were very happy to see their old friend the egg roll again. Egg rolls used to be the staple appetizer in the New York Chinese restaurants of my youth. Now they are like hen’s teeth so I had to make them myself. Mix together cabbage, carrots, jicama and 1-1/2 teaspoons of kosher salt in a colander nested in a large bowl. Allow mixture to sit for 30 minutes. Squeeze veggies to release any excess water. In a large skillet or wok, heat oil over medium heat and add onions and garlic. Stir-fry until just translucent, then add the cabbage mixture and the soy sauce. Cook, stirring constantly until the veggies are just cooked, about 5 minutes. They should still be a bit crisp. Add the preserved vegetable, bamboo shoots and pork. Season with salt and freshly ground black pepper to taste. Cool completely. You can put whatever variety of meat and vegetables you have on hand or love in these. You can use as little or as much variety as you like. Just make sure you wind up with the six cups of cooked filling needed to make 12 egg rolls. I measured 1/2 cup of filling per egg roll so you can use that formula to make more of less of them.